Freelance landscape photographer based in Lancashire. Still got a normal job in engineering, but hoping to dedicate more time to my photography in the next few years. I first started getting into photography about 5/6 years ago and have found that landscapes is really where my passion lies. I'm a DSLR user and enjoy most types of landscape photography, but feel much more in my element when I'm in the hills and mountains. I just love the dramatic light you often get and enjoy the challenge of being up high at the start and end of the day. Just started a new blog (www.astannard.blogspot.com) as well, to provide a more informal side to my existing website. For those that don't know (and you can find out more in this issue of the magazine), Galen Rowell was a photographer, climber and all-round adventurer. Born in California he and his wife sadly died in plane crash in 2002, but he left behind a legacy of fantastic photography, particularly images taken high up in the mountains. Mountain Light is a celebration of Galen's pursuit of what he called 'Dynamic Landscapes' - landscape images that combined rapidly changing light conditions, spectacular mountain scenery and often an athletic pursuit of these conditions. It's a book full of inspiring landscape images, but this isn't just a coffee-table book - it's a real photographers book and its 240 pages include an amazing amount of information and tips on landscape photography, as well as a short history of Galen Rowell's own photographic development. In essence the book can be split into two parts; seven chapters discussing various aspects of Galen's work and eight 'Exhibits', each containing the story behind a number of similarly themed photographs. The chapters themselves are basically pure text, and whilst they do take some time to read they are well worth the effort. Starting with Galen Rowell's early photographic career they take you on a journey through Galen's mind; his approach to photography, how he looks at composition, light, equipment and pretty much everything else you could ask for. Even the experienced photographer will find plenty of useful information and it's the sort of book that makes great reading if you're feeling in a photographic lull. Whilst the chapters make great reading, for me it's the 'Exhibits' that really shine. These look at a series individual photographs and analyze them in more depth. Not woolly artistic intent but real information; the circumstances that led to the images, the thought processes behind them and the technical compromises that may have been necessary in their making. In fact if I had one complaint it would be that I'd like to see more them - as it is the book is a little text heavy compared to most photography books. It's also in these exhibits that Galen's own distinctive style comes through, not just via the images, but also by the accompanying text. Many of his images come from anticipating certain light condition coming together and Galen is someone who happy to take an active role in pursuit of these conditions - not afraid to run with his gear to reach location before rare and transient conditions disappear. To a newcomer to photography his style may appear to involve a certain degree of luck, but in reality it is his experience that allows him to be in the right place at the right time, and his finely-honed understanding of technique that then enables him to make successful images. 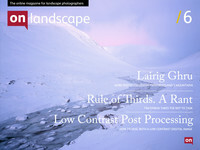 In summary this is a book that should sit proudly on a landscape photographer's bookshelf. Although the book is principally about film-based photography (you're not going to find any tips on Photoshop or post-processing technique) the vast majority of the information is just as applicable to digital photographers. Whilst the images are more than capable of speaking for themselves, the textual content of the book is equally as good. Each time I pick it up I feel I learn something new, and Galen's natural enthusiasm for photography and mountain scenery shines through. This should be on your must-buy list of landscape photography books and with Galen's intrinsically dynamic style is the perfect complement to books from the likes of Joe Cornish, David Ward and Charlie Waite.